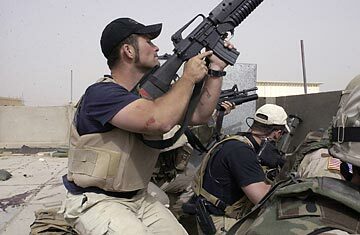 Blackwater Hit Squads: What Was the CIA Thinking? The other shoe has dropped. CIA Director Leon Panetta, it turns out, ran up to Capitol Hill in June not simply to confess that the CIA had a secret assassination program it never implemented but rather to confess that it had subcontracted the job out. As first reported by the New York Times on its website on Aug. 19, the CIA hired Blackwater to help with a secret program to assassinate top al-Qaeda leaders. Although no one was assassinated before the program was ultimately shelved  and the Times reported that it's not clear that Blackwater was engaged to do anything more than assist with planning, training and surveillance  Panetta must have been horrified that the CIA turned to mercenaries to play a part in its dirty work. It's one thing, albeit often misguided, for the agency to outsource certain tasks to contractors. It's quite another to involve a company like Blackwater in even the planning and training of targeted killings, akin to the CIA going to the mafia to draw up a plan to kill Castro. I suspect that if the agreements are ever really looked into  rather than a formal contract, the CIA reportedly brokered individual deals with top company brass  we will find out that Blackwater's assassination work was more about bilking the U.S. taxpayer than it was killing Osama bin Laden or other al-Qaeda leaders. More than a few senior CIA officers retired from the CIA and went to work at Blackwater, the controversial private security shop now known as Xe Services. Not only did those officers presumably take their CIA Rolodexes with them out the door, but many probably didn't choose to leave until they had a lucrative new contract lined up. But more to the point, Blackwater stood no better chance of placing operatives in Pakistan's tribal areas, where the al-Qaeda leadership was hiding in 2004, than the CIA or the U.S. military did. This leads to the question of what the CIA saw in Blackwater that the public still has not. Even before the company was expelled from Iraq after a Blackwater security detail in 2007 allegedly shot and killed 17 Iraqi civilians, the contractor for unclear reasons had taken over security duties that CIA staff employees used to carry out. Last May in Kabul, four Blackwater contractors reportedly shot and killed two unarmed Afghans; Blackwater whisked the four out of the country before the Afghans could investigate. The State Department has also relied heavily on Blackwater in both Iraq and Afghanistan over the years. There may even be a darker side to Blackwater. This month, a former, anonymous Blackwater employee filed a sworn statement in federal court in Virginia claiming that Blackwater's founder, Erik Prince (who is no longer involved with day-to-day operations of the company), was involved in the murder of at least one informant who reported to federal authorities on his company. The allegation, first reported by the Nation magazine, was part of a civil suit filed by several Iraqis for the company's alleged abuses in the country. Blackwater has denied the claims, calling them "anonymous, unsubstantiated and offensive assertions." Still, the CIA has maintained its various Blackwater contracts, which run from protecting CIA operatives in the field to loading Hellfire missiles on Predator drones. And none of this is to mention that as soon as CIA money lands in Blackwater's account, it is beyond accounting, as good as gone. If the Obama Administration ever hopes to get a handle on the wars in Iraq, Afghanistan or any of the countries around the world where the "war on terrorism" has been fought, it's going to have to figure out what happened to the billions of dollars spent on contracts. So far the Obama White House has been happy to work with the Bush Administration's contracting mess. In Afghanistan today, the company that supervises Blackwater is a British security called Aegis, which is headed by a notorious British mercenary. Afghans are a people that do not take well to mercenaries. Even more troubling, I think we will find out that in the unraveling of the Bush years, Blackwater was not the worst of the contractors, some of which did reportedly end up carrying out their assigned hits. Baer, a former Middle East CIA field officer, is TIME.com's intelligence columnist and the author of See No Evil and, most recently, The Devil We Know: Dealing with the New Iranian Superpower. Read a brief history of secret CIA missions. Read "CIA's Secret Program: Why Wasn't Panetta Told?"